Gas Cylinder Manifold is a high pressure structure specially fabricated for interconnecting two or more numbers of cylinders to a common gas supply line when consumption of gas is high. 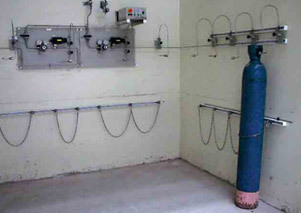 Manifold interconnects two or more number of cylinders for the purpose of availability of more gas at source. The Gas Manifold pressure can be reduced to operatable pressure by a pressure regulator. 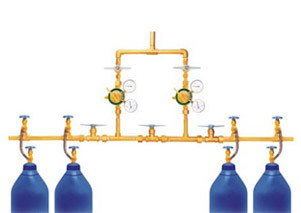 The pressure regulators can be conned to two manifolds resulting in changeover of manifolds. The changeover can happen manually or automatically changing the gas supply from one bank of cylinders to the other bank without interrupting the continuity of the supply. Manifolds comprise a control panel, manifold racks, tailpipes and an isolation valve and a pressure relief valve. Excelgas supplies custom made gas specific manifolds for all types of applications.